The British Gazette » A Tale of Two Downtons. Last night, the broadcast media served up a Christmas treat for the Great British Public. 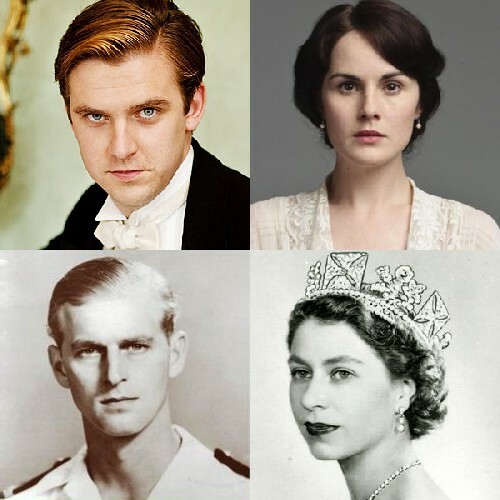 In the final two minutes leading up to 11:00PM millions of women will have oohed and ahhed and otherwise expostulated in their feminine ways when Mathew Crawley got down on one knee and proposed to Lady Mary – and she said yes. We blokes will have been very pleased to find that when we hopped channels to BBC News 24 to catch the 11:00PM news as the credits (of Downton) began to roll, there was 10 seconds to go. We blokes will also have been indebted to HRH the Duke of Edinburgh for conveniently arranging things so that his stay in Papworth Hospital provided the lead news item which enabled the women-folk to have ceased or reduced their chitter-chatter [this is a politically correct free zone] by the time the major news items of the day were reported upon after the Duke – to whom the British Gazette sends its best wishes and hopes for a full and speedy recovery. Of course, this first news item was not just about four of the Duke’s grandchildren visiting him, but of the attendance of his family without him at Sandringham church for the Christmas morning service. These two televisual events underline the preoccupation and fascination with the lives of the titled classes. There is a curious “love hate” relationship between the masses and this very small group that still forms part of our nation’s makeup. Viewers were witness to the “love” side of this relationship when the cameras showed a crowd of smiling and cheerful well-wishers lining the entrance to the parish church to wave and greet the Royals as they entered and left the church. Be in no doubt, these will not only have been locals. Many will have travelled many miles (kilometres for you Derek!) to proffer their loyal good wishes and season’s greetings. Sociologists discuss the whys and wherefores of this central element of our nation’s psyche and left wing politicos despair and gnash their teeth about it. Indeed, the influence these lefties have had since the 1960s are a key reason why this country is suffering hugely with the skills shortage that so badly hampers British business. This preoccupation with social class and their obsession that it is a bad thing has crippled the competitiveness of British industry. The results are to be seen in Germany. German industry has been the principal beneficiary of this. Of course there are those who lament that this country can never compete with such as China and India with their low wage economies. Well Germany does. And very successfully too. There is in fact a particular similarity between the obsession with the British social class structure and the obsession with CO2. It is this: that the British social class structure and CO2 are somehow both problems that need solving. It is rather like a medieval doctor diagnosing a perfectly harmless mole as a “hideous excrescence” and have cut it out – with a dirty knife, giving the previously healthy patient septicaemia and killing them! The left wing social engineers in their attempt at social engineering have over the last half century left this country in an absolutely parlous state. In and of itself, this would have been a serious enough problem, but as British Gazette readers know, there is a “perfect storm” brewing in 2012 when the European project finally hits the buffers. The fallout from this disaster with be hugely damaging to the British economy. If our youngsters had been properly educated in schools not fettered by political correctness and the equality and diversity agenda they would have had more of a chance. As it is these youngsters will be fully justified in considering themselves to have been terribly ill-used.